This spacious home offers a "Grande" living, dining, kitchen area open to a nice covered patio overlooking the private pool. The home is equipped with individual A/C and ceiling fans in each room. 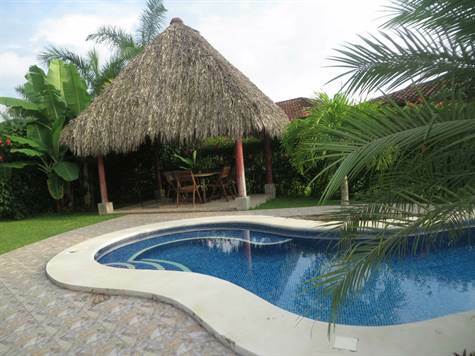 There are 3 very spacious bedrooms and bathrooms, a one car garage and an outdoor grass top Palapa by the pool perfect for barbecues and hammocks! It includes decorative ironwork on all the windows and the front and back porches are screened. The furniture is included and also appliances like a dishwasher, electric stove, space saving microwave, refrigerator and washer/dryer.